UPDATE: Check out our IFA 2011 page for news on this year's show. 3D TVs, connected TVs and tablet PCs are dominating IFA 2010 – the biggest consumer technology show in Europe. The first press conferences at the show are already underway. 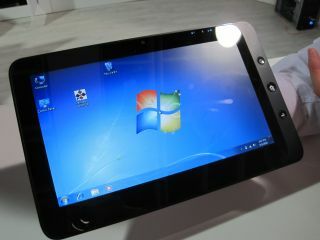 ViewSonic unveiled two tablet PC devices at this year's IFA tech-festival. The first, the 7-inch ViewPad 7, is akin to the Samsung Galaxy Tab (but with a poorer specification). The ViewPad 100, meanwhile, looks much more interesting. It boasts a dual boot feature so users can switch between Android 2.2 and Windows 7 Home Premium. LG had two interesting HD TVs on show. The company is calling its LEX8 the world's first 'Nano LED' TV, as it diffuses the LED backlight more efficiently thanks to an extra layer punctured with tiny holes. OLED fans will be drooling at the sight of a 31-inch TV prototype (although it's not yet ready for commercial use). Toshiba doesn't want to be left behind when the tablet PC train leaves the station, so it's using IFA to announce a 10.1-inch Android tablet dubbed the Folio 100. Like the Galaxy Tab unveiled by Samsung, the Folio will run Android 2.2. It will also boast a Tegra 2 co-processor and feature a built-in camera. Thicker and heavier (and far less desirable) than the iPad, Toshiba plans to fire it from the launchpad later this year. Toshiba also took the wraps off of its first 3D ready TV. The new Regza WL768 series is timed to take advantage of Blu-ray 3D and Sky's forthcoming telly channel. It also features web apps for YouTube and the BBC iPlayer. Toshiba to show glasses-free 3D in October? Samsung used its press conference to shine a spotlight on its Galaxy Tab tablet PC. Running Android 2.2, it heralds the start of a war to produce the best keyboard-less computer. Or a fad. Remember netbooks... Either way, the Galaxy Tab has iPad-rivalling potential and will be available later this year. Philips hasn't been resting on its laurels, unveiling a 3D version of its eye-catching Cinema 21:9 HDTV. The original TV wasn't cheap and so expect the new 'Platinum' version to cost around £3,500. Philips is also demoing glasses-free 3DTV, which it hopes to launch commercially by 2013. Philips has shown lenticular 3D prototypes since 2007 but they've been often been dismissed as impractical (move your head from the 3D sweet-spot and the effect is often lost). In terms of more traditional 3D, the Dutch tech giant has a new range of 3D ready 9000-series TVsthat include Perfect Pixel HD processing and 400Hz technology. Panasonic kicked off this year's show promising to 'change the world' with a new range of 3D and web-connected HDTVs. These include the Viera VT20 and TX-P42GT20 3D-ready sets, plus 3D IPTV content in 2011 piped to consumers via Panasonic's own Viera Cast service. Sony is also being bullish about the future of 3D. During its press conference CEO Howard Stringer claimed that the company is the "strongest engine in this 3D express." While a Blu-ray 3D update for the PS3 is being promised by "the end of the year." We also spied a 'Google TV' demonstration at the Sony booth - pictures here. With 3DTVs grabbing the headlines, it's easy to overlook the growth of IPTV services. Google TV, Viera Cast, Samsung's Internet@TV and the recent re-launch of its own Apple TV box are a hint that this is where the next big telly battle will be fought. The show takes place at the huge Messe Berlin complex. There are a staggering 26 halls, plus other facilities, and it's all taken over by IFA for the first week of September. IFA always attracts strong attendee numbers and an increase in international visitors – despite the global recession. Tradeshow exhibit space for 2010 was sold out and the IFA organisers constructed temporary exhibit halls to accommodate the unprecedented number of exhibitors and new products on show. While the show is traditionally AV-centric, recent years have seen more computing wares debut at the show. Last year Samsung took the opportunity to drop several new laptop ranges, while Toshiba showed off new laptops and its Journe Touch tablet. Before the show, LG announced that it will show off the new LG LEX8 television at IFA, with what it terms 'NANO Lighting Technology', while the Korean giant has also confirmed it will be showing a 31-inch OLED TV at IFA 2010, the largest from the company so far. Archos has already announcedfive new Android tablets that it will be displaying at IFA this year. Viewsonic, meanwhile, has also announced the ViewPad 7, its first Android tablet. While Samsung has also announced the Galaxy Tab will appear at the show. The latter is a 7-inch tablet while the Viewsonic is a 10-inch model. Google' CEO Eric Schmidt will also provide the closing keynote for the show. As usual, IFA 2010 will attempt to cover the whole gamut of consumer electronics across its 121,000 square metres of showspace – mobile, home entertainment, computing, videogames, digital imaging, car audio and sat nav – as well as domestic appliances like high-tech cookers and fridges. Nestled among the 1,164 exhibitor stands at IFA 2010 is a brand new 'iZone', which focuses on the growing popularity of the Mac, iPhone, iPod and iPad with apps showcases and the latest iPhone 4 accessories – including Cinemizer glasses that will enable you to watch 3D movies anywhere. Also new to IFA 2010 is the eLibrary – an area of the show dedicated to eBooks and tablet PCs, with content providers displaying their wares. Last year there were also some new phone handsets, such as the Samsung Galaxy running Android. It's wholly possible we might see some Windows Phone 7 handsets at the show – perhaps even the Samsung Cetus running Microsoft's new mobile OS. Like Las Vegas' CES, IFA has an enviable record when it comes to breaking new technologies with past highlights including colour television (1967), MP3 (1991) and 3D TV (1998). We expect this year – the exhibition's 50th – to be no different. To make sure you stay up to date with all the brand new products, technologies and innovations being shown off at IFA 2010, make sure you follow TechRadar's in-depth coverage of events – we're there in force to bring you the very latest updates. "There is a double-digit increase this year in the amount of exhibit space sold and we anticipate a record number of product introductions," said Dr. Christian Göke, chief operating officer of Messe Berlin, which organizes IFA. "Manufacturers meet more retailers at IFA than anywhere else in the world." The main IFA 2010 show runs from Friday 3 to Wednesday 8 September, though most of the major press conferences happen today and tomorrow, so expect plenty of news right from the get-go. You can find out more about the event and what's being shown there by visiting the official IFA 2010 website.